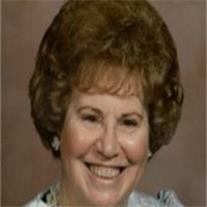 Anna May Nielson Flowers, beloved mother, grandmother, aunt, sister, and friend died in Mesa, AZ on February 8, 2012. Anna is now running, dancing, and free. Anna was born in Oakley, Idaho August 8, 1924 to Julius Nielson and Laura Olivia Jensen Nielson. Anna was the youngest of eight children in the family. When she was one year old, Anna moved to Salt Lake City with her family. Anna graduated from East High School in 1942. She enjoyed singing, dancing, and sports activities. She completed college courses at the University of Utah and at L. D. S. Business College as she worked to provide support for her widowed mother. Anna married Clifford Lionel Flowers for time and eternity in the Salt Lake City temple November 18, 1943. The marriage produced four sons: Ronald, Lynn, Paul, and Dean. Anna was stricken with polio in 1949. She remained paraplegic for the rest of her life. Yet, Anna remained very active–raising her children, serving as a teacher and as a leader in the L. D. S. church, decorating cakes, and inspiring the lives of thousands of people by her shining countenance, courage, and dedication. Anna’s husband, Clifford Flowers, died in 1986. Her son, Ronald Flowers, also died in 1986. Anna suffered the loss of Paul, her beloved infant son, when he was three days old and while she was hospitalized due to polio. Anna is survived by her sons, Lynn Flowers and Dean Flowers (wife: Lisa), and by her grandchildren, Teresa Flowers, Jeana Flowers, and Shaun Flowers. Anna married Irvin Henry Smart in 1991. They enjoyed nearly fourteen years of love and companionship. Anna dearly loved Irvin and his family. Funeral services will be held at the Mesa Arizona East Stake Center, 2228 E. Brown Rd., Mesa, AZ 85213 on February 18. Viewing will take place from 10:00-10:45 A. M. The funeral will be at 11:00 A. M.
On February 21, there will be a viewing and memorial service for Anna at Jenkins-Soffe Funeral Homes, 4760 S. State St. in Murray, UT from 10:00 A. M. until noon. Following the service, she will be laid to rest at the Elysian Burial Gardens, 1075 E. 4580 S., beside her eternal companion, Clifford Lionel Flowers. Special thanks to Wilma Peterson, Yvonne Twigg, Betty Hughes, and Don and Kindra Hughes and their children for their loving support and care for Anna during her final years.